Ice Braces are the crystal clear orthodontic option to straighten your teeth without compromising your appearance (unlike traditional metal braces). Wearing braces can be an embarrassing and hard experience for anyone, ranging from the young to old! Ice Braces are crystal clear making the whole treatment experience 100% discrete. Are Ice Braces suitable for me? Knowing which orthodontic treatment will be the most suitable for your needs can be hard for you to determine. We offer free consultations so our highly trained and friendly dentist can examine and asses your teeth/dental needs. We will be able to offer you the most suitable and effective treatment, tailored specifically to your needs. How much will Ice Braces cost me? 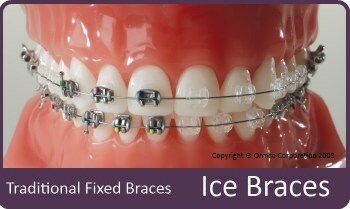 Ice Braces will start from £1,600 and will vary from patient to patient, depending on your exact needs. After the free consultation we will be able to give you a precise figure for the cost and time for completion, in a tailored patient plan.